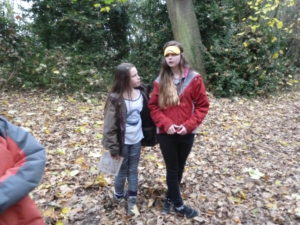 Westerfield came second in the Scout competition, congratulations to Georgina, Ellie, Esme and Ella. 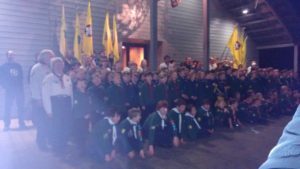 Friday 16th December and the District Cubs met at Sutton Hoo to renew their promise at 19.16 (the year Cubs started). 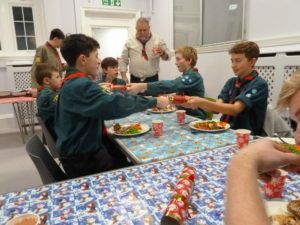 On December 13th the Group held its annual carol service at Westerfield Church. 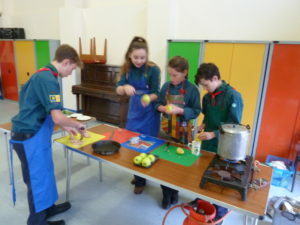 Most of the service involved the Beavers, Cubs and Scouts taking the lead. 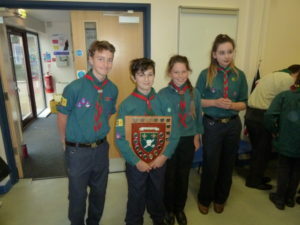 At the start, two long service awards were presented, a 5 year to David Gibson and a 30 year to Derek Austin, the Group treasurer. 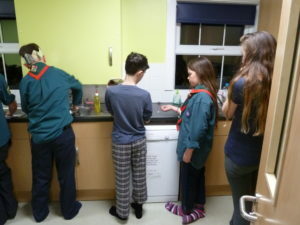 12 Scouts plus Leaders spent the weekend at Felixstowe, accommodation was indoor. Friday night and we all went down to the beach. 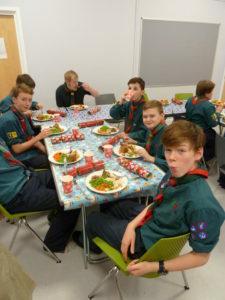 On Saturday the scouts did an activity hike organised by Anthony Gibson, in the evening there was the traditional Christmas dinner cooked by ‘Q’ followed by Pictionary.